For safety on the water before sunrise or after sunset, BIAC provides both commercial boating lights and homespun solutions that use bicycle lighting components. Please use lights on both the bow and stern for maximum safety. 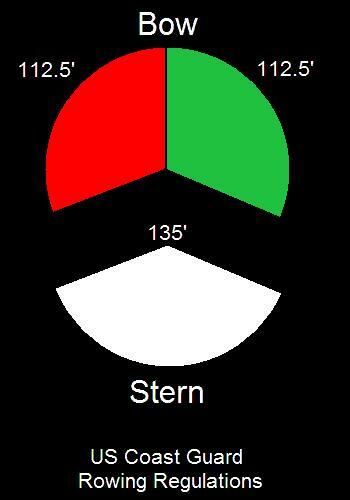 The diagram below shows the US Coast Guard lighting requirements. BIAC's sweep rowing coaches prefer Innovative Lighting products (shown at left). These large lights run on AA batteries, are waterproof, cost less than $25 per light, and mount using a suction cup. They work well on sweep shells but are less effective on the more delicate and often angled decks of single and double sculls. Coxes are responsible for their boat's lighting and cox box. We keep our lights in a locker on the waterside wall of the erg room. Please remember to a) Turn on and secure your lights to the shell before leaving the dock and b) Turn off and return the lights to the boathouse with your cox box. 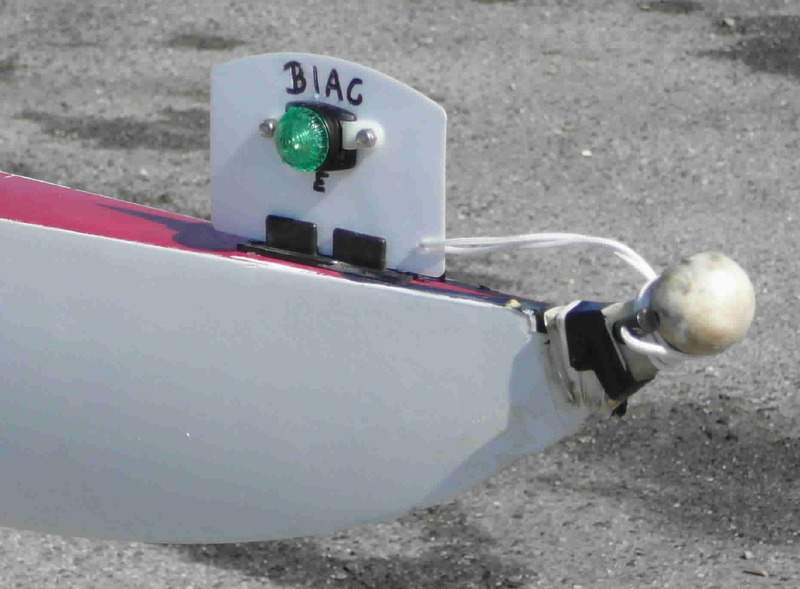 For sculling, BIAC has lighting sets from ArcNav, based on single LED lights from Adventure Lights. They are light, water proof, and easy to use and maintain. The two wafer CR2032 batteries last about 250 hours. BIAC stocks replacement batteries in our tool room. Some of our bow ArcNav lights have been modified as in the photo at right to provide better forward or onward traffic visibility by angling the LEDs forward. 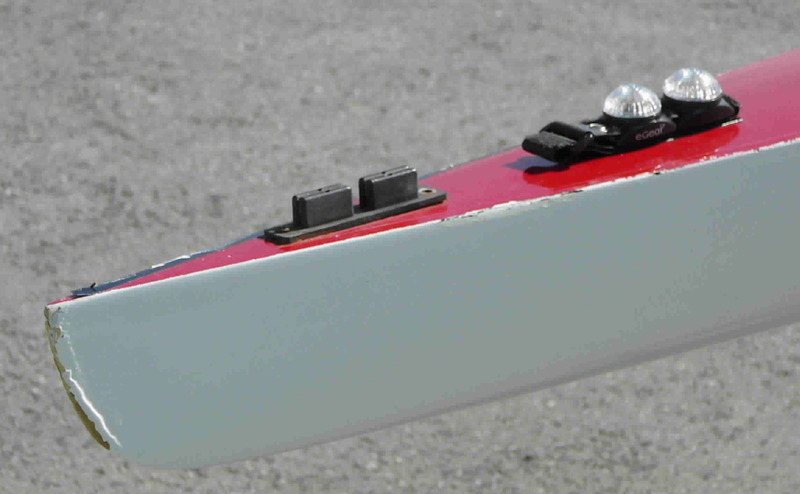 All BIAC sculling shells have bow clips and stern patches of hook Velcro. We recommend a rear (not upward) facing lighting system like the modified 3 LED white bike lighting shown below. Scullers may use the bow light adapters and extra Velcro stored in the log shed. There are also lights available from Durham Boats where the red and green units wrap around the oar shafts. If you use these, please make sure that the lights face the bow when your blades are feathered! You also need a white stern light for maximum safety and compliance.